Henry Stack-Sullivan who also known by the name Harry Stack-Sullivan was born on February 21, 1892 in Norwich, New York to Irish immigrant parents. His social isolation as a child may have contributed his later interest in psychiatry. After graduating from the Smyrna Union School, he spent two years at Cornell University, beginning in 1909. In 1917, Stack-Sullivan earned his medical degree from the Chicago College of Medicine and Surgery. Between 1925 and 1929, Stack-Sullivan worked at the Sheppard Pratt Hospital, treating schizophrenic patients with treatments considered experimental. He was a founder of the William Alanson White Institute, as well as of the journal Psychiatry in 1937. 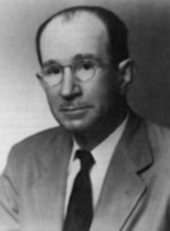 From 1936 until 1947, he was the head of the Washington School of Psychiatry in Washington, D.C. In 1940, he and a colleague, Winifred Overholser, formulated guidelines used by the United States military for the psychological screening of inductees. Stack-Sullivan's writings include The Interpersonal Theory of Psychiatry (1953), Conceptions Of Modern Psychiatry (1947/1966), Schizophrenia as a Human Process (Norton Library,) (1962), and Personal Pathology (1933/1972). Stack-Sullivan died on January 14, 1949 in Paris, France. The Collected Works of Harry Stack Sullivan, M. D.
Stack-Sullivan is known for his Interpersonal Theory. He is considered the father of interpersonal psychiatry or interpersonal psychoanalysis. He proposed the interpersonal theory of personality. He explained the role of interpersonal relationships and social experiences in shaping personality. He also explained the importance of current life events to psychopathology. The theory further states that the purpose of all behavior is to get needs met through interpersonal interactions and to decrease or avoid anxiety. The theory identifies six developmental stages called "epochs" or "heuristic stages in development." They are: infancy, childhood, juvenile era, preadolescence, early adolescence, and late adolescence. Infancy, which takes place from birth to 18 months, focuses on the gratification of needs. Childhood occurs between 18 months and six years. The main characteristic of this stage is delayed gratification. The juvenile era is between six and nine years, and is characterized by the formation of a peer group. Preadolescence, which takes place between the ages of nine and 12 years old, is characterized by developing relationships within the same gender. Early adolescence is from 12 to 14 years old, and during this stage, people develop individual identities. Late adolescence takes place between 14 and 21 years. The main characteristic of this stage is the formation of lasting, intimate relationships. Stack-Sullivan explains three types of self: the "good me," the "bad me," and the "not me." The "good me" versus the "bad me" is based on social appraisal and the anxiety that results from negative feedback. The "not me" refers to the unknown, repressed aspect of the self. In terms of anxiety, self-system, and self-esteem, the theory explains that security operations are the measures that the individual employs to reduce anxiety and enhance security. The self-system is all of the security operations an individual uses to defend against anxiety and ensure self-esteem. This theory provides the theoretical basis for interpersonal psychotherapy to treat patients with depression and schizophrenia. Interpersonal theory proposes that, most often, depression develops in the context of adverse events. Particularly, it develops in instances of interpersonal loss. The theory also addresses techniques and approaches on psychiatric interviews.